It’s important to outline the purpose of your site and the type of information you would like it to contain. Before you begin working on your site, it is necessary to have a clear idea of the purpose of this site. An informative website describing your company specialty, industry, price-range, services, other information. Placing extensive information and product pictures on your web page could be a good way to promote your business. You can hand out your web address to clients instead of sending expensive printed materials to them. Web sites can be a very good marketing tool – people who visit your site can give you important feedback about your company, sign up for newsletters, ask for services they would like to see from your business or organization. We discuss the ways to do this later. You’ve heard the word “E-commerce” everywhere; both the media and the stock market are extremely optimistic about online businesses. Would you like to enable your website for full e-commerce functionality with instant online credit card authorization and customized virtual shopping carts? We discuss ways of setting up an e-commerce operation here later on. You could add other features to your site, which are relevant to your specific business type. These can be discussed at a later stage. It’s so easy to obtain and it costs so little, that you can’t miss the opportunity of having an attractive domain name. Site design begins with configuring your headline page – the Main Page, also called Index Page. On this page, you can explain to your visitors the advantages of doing business with you (and not with someone else). Here is the list of typical pages that are referenced by links on the main page. You would tell the visitor about your business or organization. You would list the services you offer. Contact information can be placed on the bottom of every page or on a separate page. When your business or organization is divided into several departments, it’s important to create a separate page for each one, so you can list contact information for each department individually. Here you would place answers to the most common questions to offset your telephone traffic. Everything that you think is useful to your customers can be placed here. Show your customers what is going on in your company. This page alone can keep your site popular and frequently visited. You can have as many forms as needed for visitors to request information or to buy products. You can have as many pages as you decide. We could guide you through do’s-and-don’ts of additional pages. You could start out with a text-only version of your site, and later enhance it with graphics. “No graphics” site could be a good starting point if you want quick turn-around. Headlines can be composed of text instead of graphics. Remember that once you have developed a functional text-only site, you should not stop – your site would look dull without graphics. Several programs such as Adobe Photoshop or Macromedia Fireworks will help you customize the look of your fonts. The text than will become actual graphics saved as GIF or JPEG file format. There are thousands of clipart graphics available on the internet and in software packages as Corel Draw!. Make sure you use royalty-free images or obtain them from a paid software source. You can scan it yourself – you will need a scanner and digitizing software, which is compatible with the scanner. Copy centers – often your local copy-store will have computers, scanners, and friendly staff to help you convert your image into a computer file. Hire a professional firm. At Notting Hill Web Design, we can do the scanning and size for you – we are a full-service design company. There are several types of graphics work that should be left to the professional designer. Stunning, high-quality and high-resolution graphics create an unforgettable first impression and keep the customers coming back. For example, an Image Map is a combination of graphics and navigation buttons that should be completed by professional web designers since designing them involves graphics design skills plus the knowledge of programming. The context of the web page determines the size of the page. A large amount of information/text requires long web pages. This type of pages is often used for articles, reports and so on. Short pages are good for a brief, catchy statements or offers, aimed to attract the visitor’s attention and give out all the information at once. Both of these formats have advantages and disadvantages: Long pages can be large in size and take a long time to load. Short pages will download fast, but can’t deliver detailed information. It will be very inconvenient for your user to “jump” to all pages on the site in order to get complete information. Based on the type of site you are planning, choose the type of pages you will employ. The body of the page: Background. One tone or white background. Available from commercial packages such as Corel Draw!. You can find many free patterned backgrounds on the Internet. Just like custom-designed graphics, backgrounds can be tailored specifically for your site. The navigation bars Its common practice to place the same a navigation bar on the entire site. Your user will feel at “home” on your site very quickly. Text links In many cases the context will reference information from other pages on the site or from other Internet locations. Setting up a link from keywords to the referenced material will help users to find related materials quicker. Please Note! Make sure you use links to outside of your site wisely, it is possible that once the visitor leaves your site – he/she will never come back again. Horizontal lines You can separate the important items very effectively with horizontal lines. Bullet points You can use bullets to make the lists of similar items to stand out. Contact Information. This e-mail form allows the customer to contact you from every page. Last update “Last update date” at the bottom of the Index page. Please Note! Using “Last Update” function on your web page could be an important indicator for time-sensitive sites (such as financial sites, news sites etc) – therefore you should use this feature if you are planning to update your site on the regular basis. (If you are not going to change the information on the site too often, the 3 month-old “last updated” stamp could puzzle some visitors). The title is the name and description of the website that is interpreted by the browser as a title of the page, it is not really a part of the page itself. The Title is crucially important since most Search Engines use it to index your page. Make sure you use the right keywords in the title! Allows your users to record and distribute and print a unique URL page on your website. This way your user will always know where the printout came from. Monochrome pictures will create an artistic “feel” and at the same time assure faster downloading time. There are several ways to create animation. One of the most common is GIF animated format (most of the moving banners you see on the Internet are made this way). There are several technologies that can help you deliver sound to your site. Real Player, for example, will allow you to stream recorded or real-time sound right to your visitor’s computer. Notting Hill Web Design has extensive experience with Real Player applications and would be happy to help you incorporate audio capacity into your website. Once you have obtained site visitors, keep them!!! Do your best to turn them into loyal customers or members of your online community! If you have an online store and your visitors find what they are looking for, naturally you will collect all the information from this customer in order to market to him/her again. It can be as simple as a printed form that can be faxed back to you, or a more complex and more profitable! Shopping cart (with the protection of SSL, Secure Socket Layer). Newsletter subscription Offer something of value to your visitors to attract their interest. A newsletter covering a related topic can be one of those valued services. Some things that cost almost nothing to you can be of real value to other people. You can publish your free news, recommendations, and anything else people would find useful – free services attract Internet traffic! Encourage your customer to ask questions or order additional information. A strategically placed CGI form can do this simple but important job for you. You should register your site with major Internet search engines. This is the first thing you need to do after you complete designing and publishing your site. There are literally thousands of search engines and directories on the web, but only a handful are popular among almost 100% of internet users: for example Yahoo, Alta Vista, Lycos, Infoseek, GoTo.Com, Excite, HotBot. Search engine registration is simple and straightforward, but getting your site to rank high is really an art (ironically, not science). Notting Hill Web Design is an expert in effective site registration. Banner advertisement can be very effective. Make sure it is placed on other sites with a topic related (or complementing) yours. There is one drawback: placing your banner on a high-traffic site could be really expensive. There are several well-known sites (like LinkExchange) that will allow you to place your banner in an exchange program. Your banner will be shown on the sites, which belong to this program in your category, in exchange for banner exposures of other members on your site. This kind of programs can be very helpful at the beginning of your Internet promotion journey. However, make sure that this is not the only strategy you use. In most of the programs, you get to show only 3 banners for every 4 that you display. So, it is not hard to see, that your supply of banner credits will melt away rapidly without other promotional techniques. There are very many sites that would like to exchange links with you. It’s advisable to be selective about companies with which you exchange links. A good example of link exchange would be for sites that complement each other. For example Computer hardware company would benefit from exchanging links with a computer software company. You may contact the services that specialize in web news. You might be able to “make the news” and get free publicity. At least it’s worth a shot! Make sure you include your URL on all traditional advertisement including business cards, mailings, company pens, and T-shirts. To remain competitive, you need to keep up with the current events and changes. Your website could soon become a tremendous success if you update and upgrade it frequently. Your ability to maintain the site yourself is related to the way the site had been originally designed. Notting Hill Web Design creates websites with our customers in mind. Once the site is created, we can assist you in learning how to modify and update your website. Very soon you will not require our help anymore. 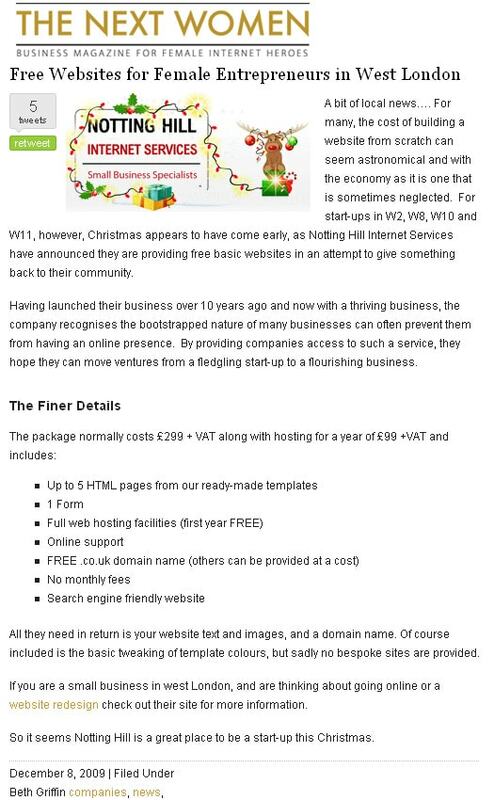 The only time you would want to contact nottinghill.biz again would be when your site requires additional functionality. Case: 5 Dillon is a brand new boutique selling fabulous, high quality, new, gently used, and reinvented items at incredibly accessible prices. As the boutique is located in a small town there are limitations on the number of customers that may visit the store. 5 Dillon wanted to expand their potential customer base by having a strong online presence and an online boutique where selected items will be available to purchase. Solution: We created a site that mimicked the look and feel of the beautiful cottage that the boutique is run from. The E-commerce facility enables 5 Dillon to maintain their online shop and receive payments online. The built-in Content Management System gives them the ability to manage and update their website text as required. The site has also incorporated features to maximize marketing opportunities, such as signing up to 5 Dillon’s mailing list, and friend referrals as well as links to their Facebook and Twitter pages. Results: As a physical store 5 Dillon’s customer base is limited to the residents of their town. Now they have an online presence 5 Dillon can now reach a far wider target market, maximizing their opportunities for sales and income. Click here now to connect with us on Facebook.